Finding a good defender? Cool. We don’t sell them but we can tell you about Sony Xperia Z5 Premium, best in market screen protectors. This is Ringke’s premium tempered glass screen defender exclusively for Sony Xperia Z5 premium. This real glass makes a visible difference in the touch sensitivity and display. The glass is knife-resistant (9H) to prevent scratches, dents and breaks on phone’s screen. It goes on the unit nice and smooth and has rounded edges for sleek curvature and to align screen protector surface with the device. Highly recommended. “Simply the best in the market. Also, it fits all the edges with a bumper on. So there is no gaps (I also used Ringke fusion as a bumper/cover.” – Amazon’s Customer Review. This is Sevenmore’s 2.5D round edges tempered glass screen defender. The unit is anti-scratch, shatterproof and has a high touch sensitivity. It poses no threat to the original feel and look of your smartphone. The 9H hardness can effectively protect your device from unwanted scuffs and scratches by knife, keys and other hard substances. One-push, bubble-free and fingerprint installation. “Screen protector received quickly and fitted my screen perfectly. Due to user error, I had to apply it twice. Taking it up the first time and clearing the screen with the provided cleaning cloth and attempted a second try. Much to my delight, the screen went on quickly. I feel much more secure knowing this glass protects my phone’s screen. A great purchase that could prove to be priceless when you (inevitably) drop your phone.” – Amazon’s Customer Review. 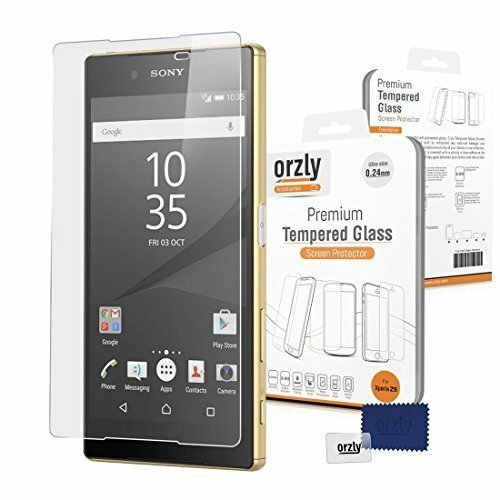 This is Orzly’s premium tempered glass screen protector only 0.24mm thick and boasts a hardness of 9H on Mohs scale. The high response and high touch sensitivity maintain the original experience. The manufacturers guarantee 94% light penetration ratio and the oleophobic coating reduces smudges and fingerprints, ensures easy cleaning. The rounded edges provide a firm grip and the unit has a shatterproof film on it. An incredibly good deal. “Awesome product, probably the best HD style tempered glass screen protector I have ever purchased. I’ve had some that cost allot more, and they eventually scratch, this one is amazing. Feels indestructible” – Amazon’s Customer Review. This is Wunderglass’s design for the front and back screen defender of the subject. This unit features the best bulletproof glass for your smartphone. Precisely cut to accommodate camera and sensors the unit is incredibly simple to install and comes with the alcohol pad for cleaning. Promises long and uncompromising protection and protects the display from drops scratches, therefore avoiding expensive repairing cost. “Excellent, the glass itself has a decent feel, and the oleophobic coating is doing a decent job so far. Sizing is pretty close to the edges, maybe .5mm off. I only wish it came a little thinner.” – Amazon’s Customer Review. This is Anoke’s tempered glass screen defender (front & back) for Sony Xperia Z5 premium. Highest transparency maintains the natural viewing display. The unit is 0.3mm thick, rates 9 on Mohs scale of hardness (knife-resistant) and is made anti-oil. The electrostatic adsorption makes it extremely easy to install and the unit is anti-scratch to save from the annoying scratches from keys and stuff. This screen protector cracks into small pieces that are held within the film (if broken). They are not sharp, making it safer than other glass products. “Fantastic screen protector it protected my z5 premium against a hard fall and my screen is flawless.” – Amazon’s Customer Review. This is Stilgut’s 9H, tempered glass screen protector, front and back for Sony Xperia Z5 premium. Extremely resistant to scratches and does not scratch by keys or other sharp objects. Comfortable touch, and breaks into small pieces in a film which holds them within it to avoid the mess or any cuts. The unit is only 0.33 mm thick and maintains the original touch and transparency. Precise holes are cut for accessing camera and sensors. “Not bad, fitment and cutting are good. Hopefully, it can provide better protection against screen crack! !” – Amazon’s Customer Review. This is Dayjoy’s front, and back, oil and waterproof tempered glass screen protector for Sony Xperia Z5 premium. The unit is knife-resistant and protects your phone from unwanted scuffs, scratches or cracks. It has precisely cut holes for the camera (front & back) and other sensors. Fits like a charm and a joy for your phone. “Have used it for two months now – clear and scratch-free. Good product.” – Amazon’s Customer Review. Jasinber’s features a 9H (hardness), anti-fingerprint and anti-scratch screen defender. The unit allows a bubble-free installation and the 99% high-definition transparency retains the original touchscreen experience for extreme clarity. Delicate smooth touching with absolutely no interference on the touchscreen and super easy installation since the new auto adhesive technology provides a spreading adhesion, with a simple swipe across the surface. Highly recommended. This is Rhidon’s 9H hardness, 0.3mm, 2.5D, front and back tempered glass screen defender for your smartphone. The unit is shatterproof and shockproof and resistant to dirt and scratches. It allows a bubble-free installation and is electroplated coated. A little glitch, does not have front camera cutout but fits and protects well. “This product is excellent. I buy it for my Sony Xperia Z5 premium, I wasn’t sure if a glass screen protector was a good idea, but having seen this in action, I’m glad I went with this over the regular plastic ones. Very surprisingly this screen protector was easy to apply, much easier than the previous matt finished screen protectors I have used. ” – Amazon’s Customer Review. This is PThink’s anti-scratch, 9H, 0.3mm, ultra-thin screen defender with greatly intensified surface hardness which is 3 times stronger than regular PET film. Tempered glass film provides super smooth touching as well as no loss in touch screen sensitivity. Upon heavy impact, the nano glass cracks into small pieces that are held within the film with safety with no pointed edges exposed. The package comes with 1 x glass screen protector, cleaning wipes, cleaning cloth and an install guide. “Wow, you don’t know how well something works until it’s put to the test. Well, this was the weekend– My phone fell smack on its face, and when I picked it up I truly thought my screen was shattered. Looking closer, though, I was shocked and excited to find that only this cover broke and my phone screen was still in perfect condition! I’ve already ordered the replacement.” – Amazon’s Customer Review. We would appreciate your valuable feedback in the comment section below.They don’t work efficiently if you overload them so you got to keep the balance.